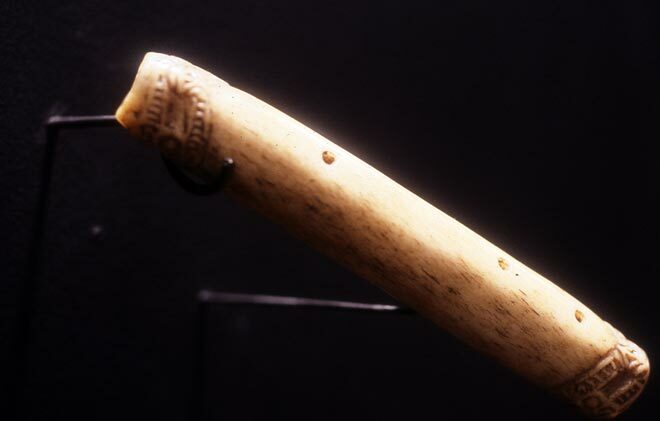 This ancient bone kōauau (flute), with a carved face at each end, is said to be the instrument played by Tūtānekai to his lover, Hinemoa. It is named Te Murirangaranga after a powerful tohunga who was killed soon after Tūtānekai was born. The kōauau was made from the tohunga's right arm, and named after him. In 1864 the Te Arawa chief Tohi Te Ururangi was killed in battle while wearing Te Murirangaranga around his neck. Some years later this precious taonga was presented to Captain Gilbert Mair, who donated it to the Auckland Museum in 1890. In 1993 Te Murirangaranga was formally returned to the Te Arawa people.